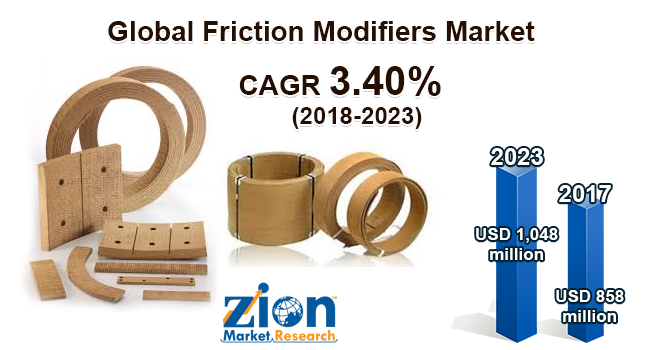 With the presence of a large pool of participants, the global friction modifiers market is displaying a highly competitive business landscape, finds a new research report by Zion Market Research (ZMR). Lubrizol, BASF SE, Afton Chemical Corporation, AkzoNobel N.V., and Evonik Industries are some of the key vendors of friction modifiers across the world. These players are focusing aggressively on innovation, as well as on including advanced technologies in their existing products. Over the coming years, they are also expected to take up partnerships and mergers and acquisitions as their key strategy for business development, states the friction modifiers market study. Citing an instance, in November 2017, AMSOIL introduced a boosted friction modifier formulation of XL Synthetic Motor Oil line of lubricants. The company sources claim that the new formulation offers more cleansing power as compared to its predecessor and enhances the engine life for current advanced automotive technology such as direct injection and turbochargers. As estimated in this report, the Global friction modifiers market stood at US$ 858 million in 2017. Witnessing a tremendous rise during the period from 2018 to 2023, the revenue in this friction modifiers market is expected to reach US$ 1,048 million by the end of the forecast period. The main types available in this market are In-organic and organic. Among them, the demand for organic friction modifier is relatively higher and the trend is anticipated to remain so over the next few years, notes the research report. “Mounting awareness pertaining to vehicle maintenance along with need to enhance lubricity and energy efficiency in automobiles will boost friction modifiers market trends in the years to come,” says the author of this study. Apart from this, favorable government policies and easy availability of raw materials will leverage the growth of friction modifiers market over the coming years. In addition, humungous demand for the product in aviation and marine sectors is forecast to favorably impact the friction modifiers market size in the ensuing years. Cost-effective substitutes for the product such as detergent additives and oiliness agents, however, will hinder the progress of friction modifiers market over the years ahead. Nevertheless, manufacturers are focusing on introduction of new products and this will generate lucrative avenues for friction modifiers market in the near future, thereby normalizing the impact of hindrances on the market, reports the study. Regionally, Asia Pacific has been leading the worldwide friction modifiers market and is anticipated to continue on the dominant position in the years to come, states the friction modifiers market study. Escalating demand for friction modifiers and government support is the main factor behind the dominance of the Asia Pacific friction modifiers market. In addition, immensely rising disposable income along with drastically altering lifestyles of the population is another significant factor that is supporting this regional friction modifiers market.